You can’t make this stuff up. 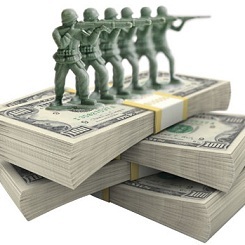 The most obvious way to stimulate the economy is to replace military equipment? And the Obama stimulus had nothing for the Defense Department? When veterans’ benefits and other past military costs are factored in, the military now devours half the U.S. budget. If military spending is such a cost-effective stimulus, why have the trillions poured into it in the last decade left the economy reeling? Military spending is the very essence of “built-in obsolescence”: it turns out products that are designed to blow up. The military is not subject to ordinary market principles but works on a “cost-plus” basis, with producers reimbursed for whatever they have spent plus a guaranteed profit. Gone are the usual competitive restraints that keep capitalist corporations “lean and mean.” Private contractors hired by the government on no-bid contracts can be as wasteful and inefficient as they like and still make a tidy profit. Yet legislators looking to slash wasteful “entitlements” persist in overlooking this obvious elephant in the room. The reason massive military spending is considered the most “obvious” way to produce a fiscal stimulus is simply that it is the only form of direct government spending that gets a pass from the deficit hawks. The economy is desperate to get money flowing through it, and today only the government is in a position to turn on the spigots; but there is a tourniquet on government spending. That is true for everything but the military, the only program on which the government is allowed to spend seemingly without limit, often even without oversight. Chalmers Johnson estimated in 2004 that as much as 40% of the Pentagon budget is “black,” meaning hidden from public scrutiny. The black budget is so top secret that Congress itself is not allowed to peer in and haggle over the price. Democratic control of the military has broken down. The military is being used for purposes that even Congress is not allowed to know, much less vote on. The U.S. is no longer a constitutional republic but is a national security state. Foreign policy is determined behind closed doors by powerful private interests that use our military presence abroad to secure their access to cheap labor, markets and resources. At least, we assume that is what is going on. A declared objective of U.S. military policy is “full spectrum dominance.” That could well mean dominance over the American people along with everyone else. That explains why the country seems to be permanently at war. If we had peace, the war machine would be out of a job. Every year since World War II, the U.S. has been at war somewhere. It has been said that if we didn’t have a war to fight, we would have to create one just to keep the war business going. We have a military empire of over 800 bases around the world. What is to become of them when the lion lies down with the lamb and peace reigns everywhere? Fortunately, there is a way to solve these problems without maintaining a perpetual state of war: keep the jobs but convert them to civilian use. Military conversion is a well thought-out program that could provide real economic stimulus and national security for people here and abroad. Existing military bases, laboratories, and production facilities can be converted to civilian uses. Bases can become industrial parks, schools, airports, hospitals, recreation facilities, and so forth. Converted factories can produce consumer and capital goods: machine tools, electric locomotives, farm machinery, oil field equipment, construction machinery for modernizing infrastructure. In the early 19th century, when we had no major wars to fight, the U.S. military was turned into a civil service that built infrastructure for the nation. A successful modern example is the　United States Army Corps of Engineers　(USACE), the world’s largest public engineering, design and construction management　agency. Its mission is to provide vital public engineering services to strengthen the nation’s security, energize the economy, and reduce risks from disasters. Generally associated with dams, canals and flood protection in the United States, USACE is involved in a wide range of public works both here and abroad. The Corps of Engineers provides 24% of U.S. hydropower capacity and is engaged in environmental regulation and ecosystem restoration, among other useful projects. The late Seymour Melman, a professor at Columbia University, wrote extensively for fifty years on “economic conversion”, the ordered transition from military to civilian production by military industries and facilities. He showed that a carefully designed conversion program could create more jobs than the war machine sustains now. The military actually destroys jobs in the civilian economy. The higher profits from cost-plus military manufacturing cause manufacturers to abandon more competitive civilian endeavors; and the permanent war economy takes engineers, capital and resources away from civilian production. This research and production is not easily transferable to civilian use, since it has been designed for tasks that are radically different from civilian needs. And because we have put so many resources into military production, we have fallen behind industrially. A 2007 study by Robert Pollin and Heidi Garrett-Peltier of the University of Massachusetts found that government investment in education creates twice as many jobs as investment in the military. Spending on personal consumption, health care, education, mass transit, and construction for home weatherization and infrastructure repair all were found to create more jobs per $1 billon in expenditures than military spending does. Clearly, the half of the budget now going to military pursuits could be better spent. If we are going to double exports in the next five years, as President Obama has pledged, we will need to divert some of the resources poured down the black hole of war to productive civilian industry. Prepared for “The Military Industrial Complex at 50”, a conference in Charlottesville, VA, September 16-18, 2011. Ellen Brown is an attorney, author, and president of the Public Banking Institute, http://PublicBankingInstitute.org. In Web of Debt, her latest of eleven books, she shows how the power to create money has been usurped from the people, and how we can get it back. Her websites are http://webofdebt.com and http://ellenbrown.com.